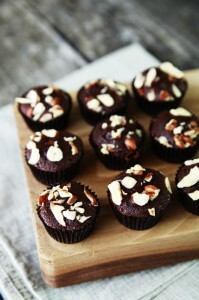 I’m very excited to share with you today’s recipe for Nutella brownies. My excitement has nothing to do with the fact that anything made with Nutella tastes better. However, I’m excited because this recipe only contains only four ingredients!!! Now you may be asking yourself right this minute on whether or not you can trust a brownie recipe with only four ingredients. This is a fair question I will address because I had some skepticism myself. But rest assured, these little hazelnut chocolate bites are well worth the 3 minutes (if that) it took for me to mix the batter and the 12 minutes it required to bake. This recipe comes from pasty chef, cookbook author, and Fine Cooking Magazine’s contributing editor, Abby Dodge. She has a new cookbook coming out next week called Desserts 4 Today: Flavorful Desserts with Just Four Ingredients filled with fabulous everyday desserts made with only four ingredients. She gave me permission to post her fabulous recipe here – Thanks Abby! 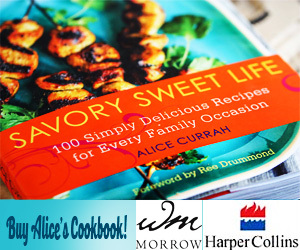 I’ll be doing a review of her cookbook on Savory Sweet Life later in the week and will also be giving away a few copies. So stayed tuned! Back to the brownies. 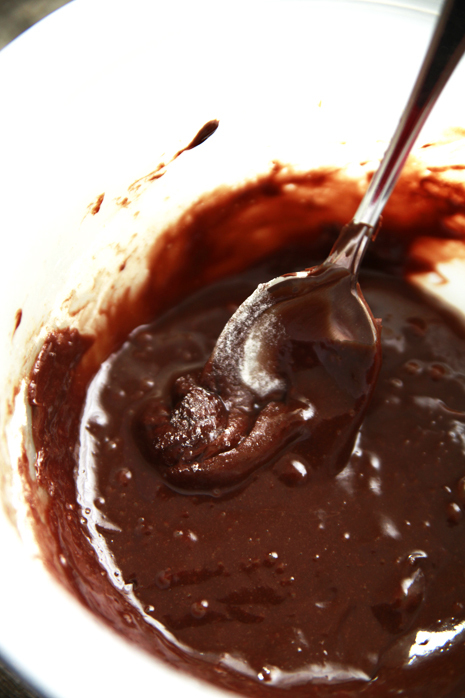 The texture of the brownies are more similar to a gooey cake.. .molten lava cake to be exact. If you’re hoping for a chewy brownie, these are not it. Instead, they are more like super moist cake except the brownies literally melt in your mouth. The recipe makes exactly 12 mini cupcake sized bites and it is hard not to eat them all in one setting. 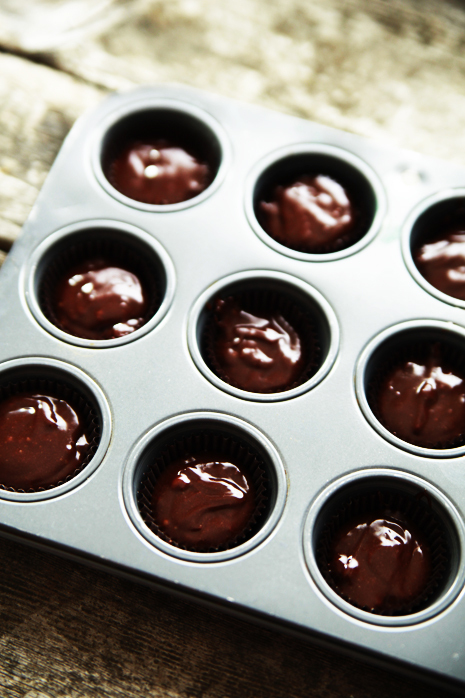 I can already tell these little chocolate bites of yumminess are going to become my regular late night pick me up snack. I should also mention, this recipe does not require a mixer and children can easily whip up a batch. Enjoy! 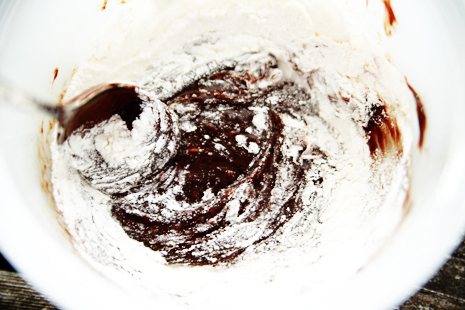 Amazing Nutella brownies using only four ingredients. Reprinted with permission from Abby Dodge, cookbook author of Desserts 4 Today: Flavorful Desserts with Just Four Ingredients. Heat the oven to 350 degrees. 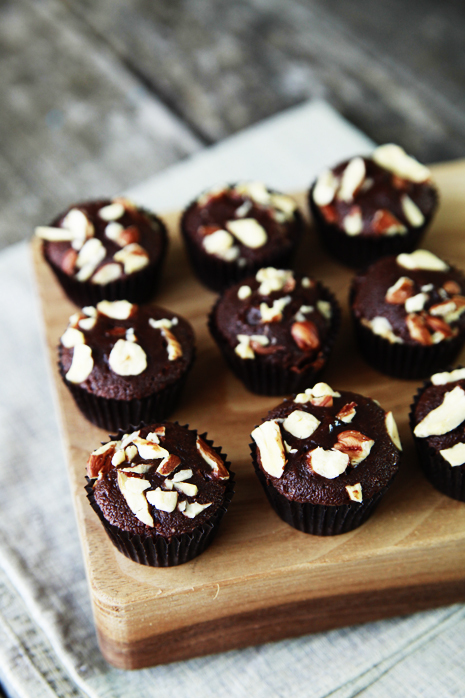 Line a 12-cup mini muffin pan with paper or foil liners. 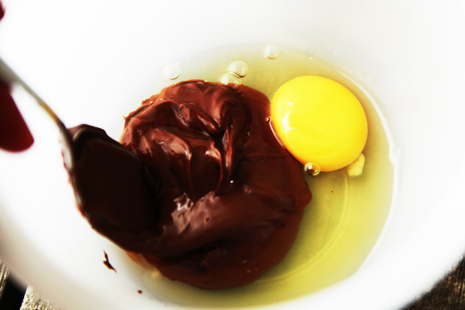 Put the Nutella and egg in a medium bowl and whisk until smooth and well blended. Add the flour and whisk until blended. Spoon the batter into the prepared muffin tins (about ¾ full) and sprinkle with the chopped hazelnuts. Bake until a pick comes out with wet, gooey crumbs, 11 to 12 minutes. Set on a rack to cool completely. Serve immediately or cover and store at room temperature for up to 3 days. Wow – pretty hostile response( to a complete stranger) for a book author and blogger. That said, great recipe. Everyone loves these. In the post it states MINI cupcake bites. Not sure how you arrived at a standard sized cupcake tin. Considering you are a professional baker, I would have assumed you would have noticed the yield of the batter before baking to know these weren’t going to fill a standard size tin – maybe 3 regular sized tins. BAKERS BEWARE: The ingredient measurements are inconsistent with the yield, or, in other words, YOU WILL NOT GET 12 STANDARD SIZE BROWNIE/MUFFINS – YOU WILL GET 6. 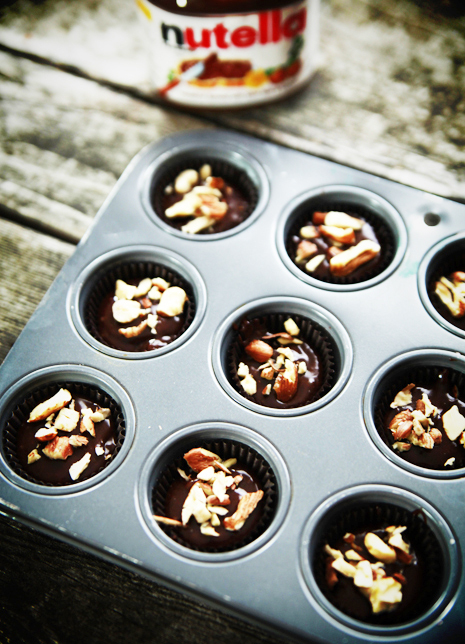 Using a mini muffin tin will yield about 10-12. It’s hard to believe that so many readers have responded to this recipe claiming they have made these and have not mentioned this basic information at all; I am a professional baker and I knew the minute I read the recipe it wouldn’t yield 12 . Also, the baking time is longer than 11-12 minutes at 350 degrees Fahrenheit. Use a timer, test them at 12 minutes and judge for yourself – personally, I like my brownies fully baked, not raw in the center (and I have a Viking stove which is pretty darn good when it comes to baking!). AND HOW MANY BROWNIES DID YOU GET? I love this recipe. It’s so simple and easy to make. Plus, it’s yummmm. My family love these. You might applesauce or banana. Hi there! I could have sworn I’ve been to your blog before but after browsing through many of the articles I realized it’s new to me. Nonetheless, I’m definitely pleased I came across it and I’ll be book-marking it and checking back often! 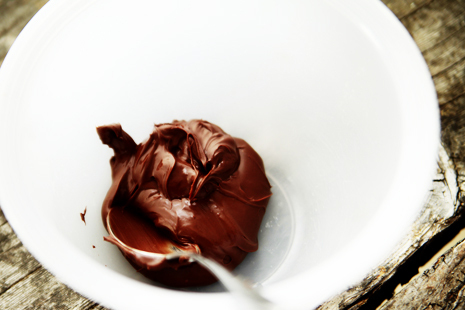 is it ok to use Cadbury chocolate spread instead of using nutella? 350 degrees in celsius or farenheit? Thank you so much for this recipe! I was having a craving for something chocolatey and yummy, and this was definitely it! Not only are they moist and rich, but they are the perfect amount of chocolate, and because it doesn’t make TOO much like some mixes and recipes, this made the perfect amount for me to not feel bad if I eat the whole pan! I made mine in a round 7 or 8 inch pan, upped the time by a minute and only used 4 tablespoons of flour instead of 5!they came out perfectly! Again, thank you so much! This tastes delish. I baked this and it was gooey on the inside and nice and chewy on the outside. Awesome recipe! Um, how bout you calm down and go make yourself a freakin sandwich.